Henry Ford and Thomas Edison camping together? What will these playwrights think of next? In fact, Ford and Edison apparently did camp together annually for some years, and in 1921, even invited President Warren G. Harding to join them. It would prove to be the last camping trip for Ford and Edison. Playwright Mark St. Germain (whose previous work “Freud’s Last Session” posits a meeting between the well-known founder of psychoanalysis and writer C.S. 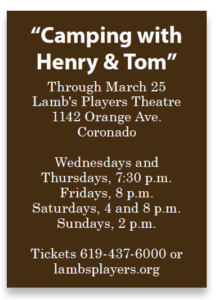 Lewis), begins here with the facts and imagines what Ford, Edison and Harding did out there in the woods together in “Camping With Henry & Tom,” playing through March 25 at Lamb’s Players Theatre. The trip starts with a less-than-felicitous event: Ford, driving his signature Model T, swerves to avoid a deer, but ends up hitting both the deer and a tree, cracking the car’s block, leaving the deer in distress and the campers without transportation out of the forest. 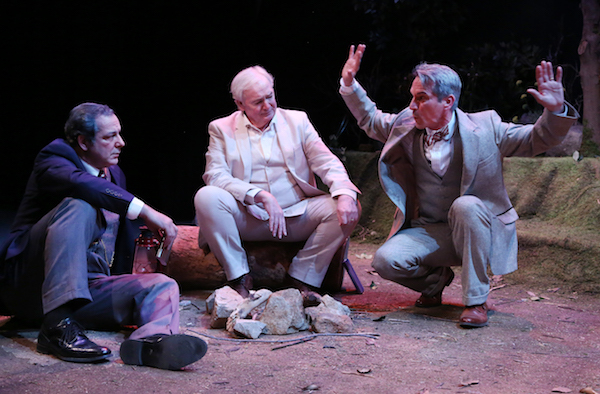 (l to r) Fran Gercke (Ford) tells a tale while Robert Smyth (Edison) and Manny Fernandes (Harding) react. What do you do when you’re stuck in the woods with no escape? Why, talk. St. Germain is known for characters who engage in clever repartee, and “Camping” is no exception. And these three are different enough characters to make this almost a discussion of how (or how not to) live one’s life. He has a sharply cynical side (demonstrated in many funny comments), but most of the time, Edison just wants to be left alone with his imagination — and a book. Francis Gercke plays Henry Ford, the driven inventor of the machine that has since become the bane and/or pride of many commuters’ lives. Ford has invited Harding because he wants something: title to the Muscle Shoals, Alabama, area in which to build a power plant. It will take Congressional approval, and Ford (who also has presidential aspirations) is willing to do almost anything to get it … even blackmail. Ford’s other less-than-admirable character traits (such as arrogance and virulent anti-Semitism) are not glossed over either. (l to r) Manny Fernandes (Harding), Robert Smyth (Edison), and Fran Gercke (Ford) at their camp. Manny Fernandes plays Harding, a senator who freely admits that he never wanted to be either married or president. He was named on the 10th ballot in 1920 after the convention deadlocked on the leading candidates because, he says, “I look like a president.” He died in 1923, about 2 1/2 years after his inauguration. He was popular at the time, but after his death, corruption in his administration (such as the infamous Teapot Dome scandal) sullied his reputation. St. Germain brings these characters up to date with frighteningly familiar comments, like Ford’s desire to “make America great again” (but without the hats). But “Camping” isn’t about plot. Ford’s ambition drives what does happen, but it’s more a character sketch of these two American geniuses and the accidental president who went along for the ride one weekend. A fourth character is Col. Starling, Harding’s Secret Service man, who gets very little to do but is well played by Jordan Miller. Deborah Gilmour Smyth’s assured direction helps by staying out of the way and not trying to engineer plot points. But her most amusing choreography for Harding and Ford deserves mention. 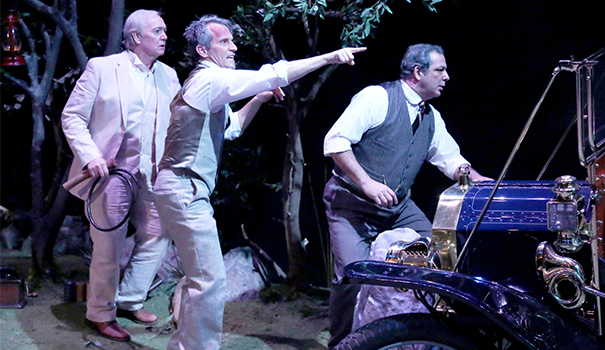 Ford conveniently brought the Edison-designed sound system, and the two cut a hilarious non-rug. Edison, of course, has his face buried in a book the whole time. Marty Burnett’s woodsy set (with trees, downed stumps and the like) certainly sets the tone for a camping trip. He’s aided by Nathan Peirson’s fine lighting and Patrick Duffy’s excellent sound design. Jemima Dutra provides clothes that no real camper would wear, but these guys had come from another event. Michael McKeon provides some excellent projections. 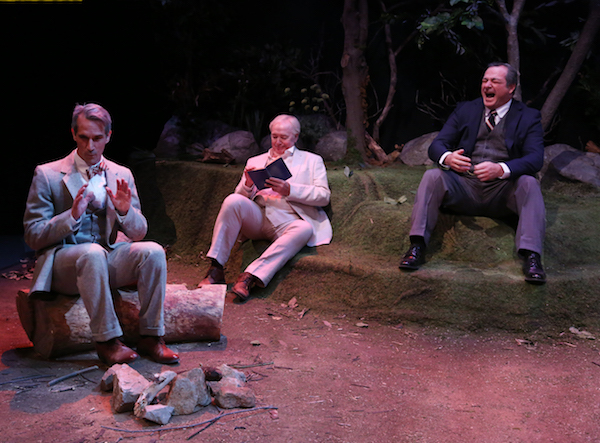 “Camping with Henry & Tom” gives these four fine actors both the chance and the huge responsibility of creating drama out of words rather than action. They rise to the occasion brilliantly.